When I renewed my Flickr Pro account last year, I received a bonus, a free photo book at Snapfish. Snapfish is one of the partners with Flickr and in addition to print on demand books, they also have the usual print products. I finally used my coupon and I received the printed photo book so I decided to do a quick review. I’ve only made a couple of photo books at a different service so I can’t claim to be an expert on photo books, however I figured there is some value in one person’s opinion of the Snapfish service. Snapfish has a web-based album creation application that worked well. My photos from Flickr transferred over to Snapfish successfully. I was able to pick a style that I liked and was able to layout the album the way I wanted. It took a bit of experimentation and it wasn’t completely obvious at first to get the exact photo layout I wanted. Then I found the button that cycles through various photo layouts which gave me the extra flexibility I wanted. So far so good. I placed the order and received the book in less than a couple of weeks which seems reasonable and met my delivery expectation from the service. The print quality of the photo book, however, was below my expectations. Way below. I understand that the 4 color printing process used for these books does not match the quality of standard prints you get from mini photo-labs. I’ve done some print testing of Bay Photo, Costco and a local camera store which I wrote about here and here, and to make it clear, I am not comparing my photo book’s print quality to these labs. Also, I didn’t expect quality anywhere near the quality that I get from my Epson inkjet printer which I talked about in this post. I was however, comparing the print quality to my previous photo books that I’ve made as well as quality that I have seen from my friend’s books. I’m not expecting complete color accuracy and color matching with the computer screen, I’m generally satisfied if the colors look bright and colorful on the finished product. The Snapfish product was dull in color and had a pronounced yellowish color cast. Maybe there was a setting to disable auto-correction mode, which I missed, but auto-correct at other labs has not changed colors to this extent. The photos lacked any kind of liveliness, the images were not only dull but seemed fuzzy. I can also clearly see some patterns on the photos themselves as though they were printed at a lower resolution. I tend to be picky about certain things and I use my wife as a sanity check to see if I’m being too exacting. My wife is easy-going and things generally look OK to her so it does take a noticeable drop in quality for her to notice. In this case, even she commented how the print quality did not look that great with the Snapfish photo book. 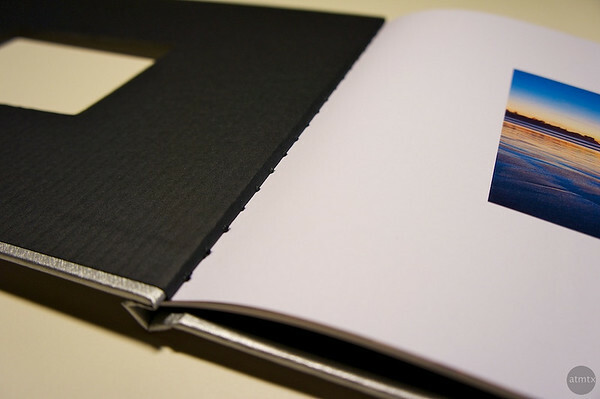 Beyond the print quality, there were other factors that made the book look and feel cheap. 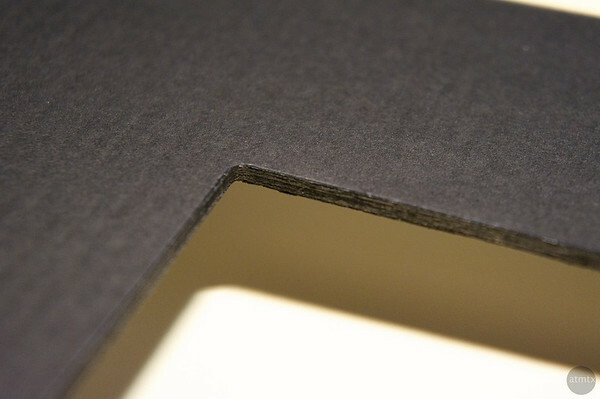 The cover used a hollow sounding cardboard that had rough edges and a shinny surface on the outside. 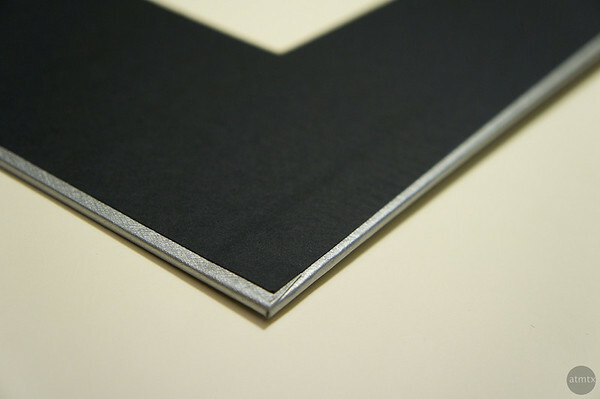 A flat black paper applied on the inside felt low-grade. A linen type cloth covering, which I’ve seen from other companies, would have added a touch of class and would have given the cardboard a more upscale feel. The paper quality was also uninspired. There was a semi-matt finish with a slight sheen which lacked any kind of texture, pop or impact. The paper was thin but felt even more unsubstantial since it was used on a 8×10 book. The same paper thickness used on a smaller book might be acceptable but on a larger book, the thinness of the pages was emphasized. Finally, the binding had an unfinished stitched look that you can see from the photograph above. If the pages are in fact stitched together, this could be a positive over glued pages, however, the exposed stitching looked rough and unfinished. The net effect of the print quality and the quality of the materials mean, that this book will remain safely hidden on my bookshelf. It may be a nice memory of my vacation but because of its lack of quality I would feel embarrassed to show it to anyone beyond my family. It certainly will not be used as a coffee table book and forget about using this as a portfolio to showcase of your photography. So can you tell that I’m disappointed? I added an extra page to the standard package and with $6.99 in shipping charges plus taxes, my “free” book came out to about $10. Since I’m underwhelmed even with the greatly reduced price, I can’t imagine how I’ll feel if I paid the full price for this thing. I would probably would have asked for my money back. At $10, I’ll keep it but I doubt Snapfish will be getting anymore of my business. I must admit, this is a pretty negative review and I feel bad writing it. It’s aways nicer to write about products and services that you are happy with. Keep in mind that, your mileage may vary. Maybe the printer was not working properly and I got a book that looks a lot worse than normal. To be fair, I should print more books to see if there are any quality differences. Also maybe there are other premium features that I could have chosen to upgrade the paper and the cover. However, the fact remains that, ultimately I am not a happy customer. Even giving Snapfish the benefit of the doubt and assuming that the printer was not working properly, there is no way to explain the quality of the cover and paper. Any service that uses these grade of materials is not one that I would want to continue having a relationship. That is why I would not even bother asking for a reprint. Their choice of materials has doomed the service for me — one that does not care about quality. Some may argue that having a “basic” quality option allows for a less expensive option. Possibly. Though I would say spending a few dollars more to get a high quality is worth it to me and if I were running the service, I would not even bother having a low-grade option, if that in fact, is what I ended up getting. As for Flickr, while I’m glad for the value add for renewing my Pro account, unfortunately, this experience has slightly diminished my opinion of Flickr. Flickr is a photo enthusiasts’ site and anyone that upgrades to a Pro account is even more serious about their photography. They need to make sure they pick partners that complement and enhance their service. My less than stellar Snapfish experience, has worked against Flickr (and Snapfish) and diminishes their brand. That is unfortunate since I’m sure this promotion was created with the best of intentions as a win-win for Flicker, Snapfish and the Flickr Pro user. I hope my experience is in the minority and there are many happy Snapfish customers out there. What’s your experience with Snapfish, please leave a comment with your opinion. Note: Please click on the image above to see a larger version. Thanks for the review. I’ve been a Snapfish customer for years and I’ve been satisfied with photo prints and collages, magnets, etc., although I’m probably more like your wife. I was just getting ready to do a little photo book of photos of my new grandson. Assuming I go forward with this, I’ll certainly keep my expectations low and look for some upgrades. I just want something to carry in my purse and show folks, so my needs aren’t as great as yours, as a professional photographer. Still…are there other services who do the same things as Snapfish? nowandthenadays, thank you for your visit and comment. I’m glad that Snapfish is working for you, that is good to hear. There are a lot of different photo book companies out there. I haven’t tried many of them so I’m no expert but I have heard from a couple of different sources that Shutterfly has some good offerings. 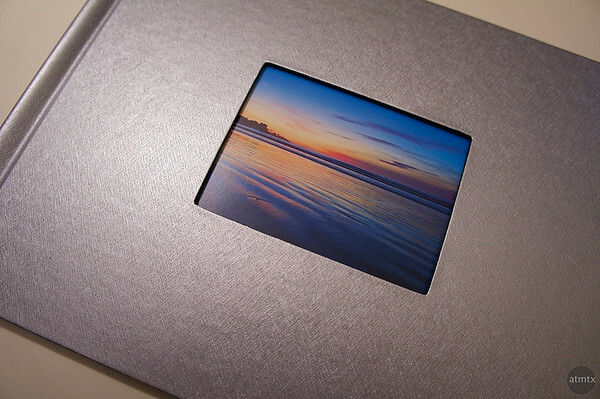 I personally intrigued about the photo books from Adoramapix. It’s a smaller printer but they actually use really photo paper to make their books. The quality looks really good. I used Blurb.com for my wedding pictures. They are amazing and not much more expensive than snapfish. They also give you $20 off your first book. Hi Judy, thanks for your suggestion. I’ve heard good things about blurb. Jeffee, sorry it took a while to get back to you. I’ve been vacationing the past week and it has been a bit hectic. The photographs that I have my watermarks on are at 1024 pixels and they are creative commons. That means you are free to use the photograph on blogs and such for non-commercial purposes. 1. keep the watermark on the photo. 3. Link back to my website. As long as its not for commercial use, you can use the photograph for free. Thanks so much, Andy. I will certainly follow these parameters of use. Yeah, lucky I only paid a little bit for it. But you know the regular price is not that inexpensive. nice write up Andy – I think that is another knock on Flickr – I haven’t done a book there (and won’t after reading this) and don’t spend much time there anymore either – curious about your thoughts on the whole Flickr thing – hope you are well my friend! Hey Jim. Thanks for the comment. My Flickr usage has definitely dropped. I’m in the midst of rethinking how I’m going to use Flickr. Still planning to use it for now but differently in the future. Wow, Thankyou for this review. I’m not a professional photographer, but I still demand excellance in the quality of a product. 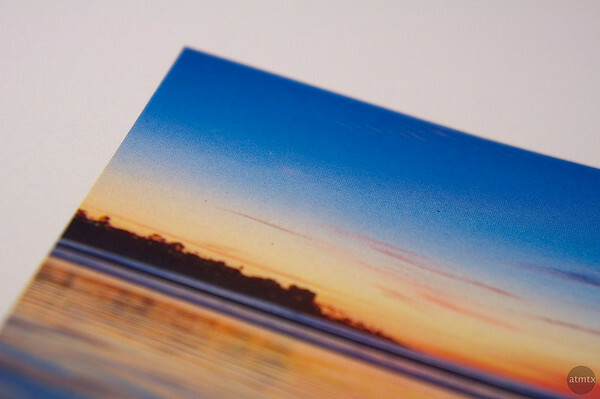 I just created four photobooks in Snapfish. They are due to arrive today. I have always used Shutterfly before and was so very pleased, but Snapfish was much easier to navigate and also much better bargains. I will be anxious do my own comparing when my latest photobooks arrive! Sunny, thanks for visiting and posting a comment. I have experienced much inconsistency in photo printing. Tried Walmart, Walgreens, Riteaid, York, Snapfish. I am not a pro but definately a hobby enthusiast doing some craft fairs and selling a little at a local coffee shop. Seems one time it will be good then dark or yellow. Do you have a reccomendation for printing? Thank you for the review. I should have read this before I ordered 4 standard photo books for a total of $200 :(. I fully agree with your review. The quality is bad. To their credit, Shapfish were willing to give me a full refund no questions asked. I did not feel good getting the 4 books for free so I asked for a substantial but not full refund which ended up paying about as much as you did per book. For $10 the book is almost worth it but for $50 (I had many pages) it is a ripoff. Val, sorry to hear about your experience. At least Snapfish was nice enough to be flexible in their pricing.